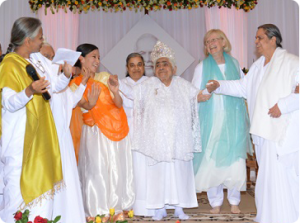 Dadi Janki, spiritual head of the Brahma Kumaris, has reached the age of 100 years. Millions around the world have been touched by her wisdom and presence. What impact has she had on your life? This is your opportunity to share a personal change you would like to make – big or small – to honour Dadi by lighting your candle below. Dadi vanakkam ,i need your blessing from you .iam happy part of sivababa child..thankyou to lid the candle on this day ..
FIRST OF ALL,WISH OUR LOVING,SWEET ANGEL (RESPECTED DADI JI )A VERY HAPPY BIRTH DAY. HONORING DADI JI'S 100TH BIRTHDAY,TODAY I WANT TO MAKE A PROMISE TO SHIV BABA AND TO MYSELF THAT FROM TODAY I WILL NEVER MISS AMRITVELA BECAUSE OF LAZINESS/SLEEP. We all are very lucky that we can see & listen dadiji. I just want to be more like Dadi…that's about it. Dadi janaki mathaa long live.100, hundred year's . Mathaa chiranjivi,,shukhiibhana.GodBless you Amma. hamare pyaare dadi ko janma din shubhkamnayein..
Dear Dadi! Om Shanti (3)! today I focusing myself on the power to tolerate! I wish to maintain inner joy and share it with whom I meet. I Wish You Dadi A Very Happy Birthday. You are a constant inspiration in my life. My best wishes for your 100 years! for reaching God! You continue to inspire everyone. has stage 4 cancer. Just as with the stroke, not a moment's sorrow taken. Thank-you, Dadi Janki, for your beautiful service. Thank you, thank you, thank you. Your message touches my heart. As I travel this path I work to be this change I wish to see in our world; one step at a time. It starts with my family and my students. As we co-operate and work together we achieve so much more. We are other centered, self-lessly serve others and we grow in love. Thank you. Wonderfull year started where Dadi completed her 100yrs and we are getting blessings from her side…being an instrument to serve the world…WoH Baba, WoH Drama, WoH Dadi.. Thanks for all the wonderful work you are doing. IThe personal change I want to make this year is to look at everyone with positive feelings and take full personal responsibility for all my negative reactions. What a divine chance to have such a soul with us in this time, thank you Dadi Janki. Dadi, thank you for your life, you've been a great instrument, wise and powerful. So close to Baba. An inspiration and example for me. Many many happy returns of the day. Dadiji. Om Shanti! God bless dear dadi Janki ! She is so adorable . I want to cleanse my heart from all the negativity and generate vibrations of love for one and all . I will sincerely try to do it ! Tapasya of dadi ji , l haven't seen any other human being on this earth doing service , of her whole life dedicated to the welfare of all the souls. I would like to take care of my actions and always watch that they won't hurt anyone in the long run. I would not make any false commitments for material benefits which will result in pain for both the person and me. I would think before I speak any word or give anyone a word. Wish you a very happy birthday Dadi and many more to come… Om Shanti! Happy Birthday Dadi! I wish love and Baba. Going beyond all trivial matters, and to share true love with all. You, the soul, are ageless & genderless. You, the soul, are a lucky 84birth deity soul. of which the last 80 years, surrendered to Baba. in both corporeal & avyakt dress. Dear Dadi, congrstulations with who you are, so brave, so pure, so full of self respect, i love you so Much and send you all THE good wishes a Heart can receive, with deep respect and gratitude, om Shanti, Judith M.
Happy birthday, hundred years of wisdom for hundred millions souls. My personal change to avoid impure food. Om shanti. She is a blessing to the world. Thank You beloved Dadi for the personal direction in this, and all lifetimes. Am Eternally blessed and fortunate for your presence. I would like to be able to follow Shrimat accurately as soon as possible. At the moment my sense organs tend to rule. I would like this to change. Soy de Lima, Perú… Brahmi hace 4 años… hoy 4 celebro 1 año mas… desde que te conocí, has sido una energía que me guia… todo lo que leo de ti me inspira, me da poder… trato de seguir tus enseñanzas… tu manera de amar a Baba… Gracias por ser instrumento tan noble, y compartirlo… Bendiciones!! Dadi, tu amor a la familia es un soporte, para nuestro crecimiento. Tu nos inspiras a mantener el fervor y entusiasmo. San Salvador. El Salvador, C. A. Just wanna say sitting in lokik i am spreading our fathers wisdom everywhere. May dadi remain haealthy throughout. I would like to be peaceful unshakabel and immovable in all the situations and people too. Happy 100th Birthday to my Sweet Dadi. When watching you and listening to your sweet voice reminds me of my lokik mother. She was just similar like you. Always with a big heart..
Om Shanti and HBD 100 years for our beloved Dadi. Thank you very much for your love and service in the past years. Nearly ten years ago my first time in Madhuban, Peace of mind program. When I came down from the stage, Dadi gave me very powerful drishti. I feel very strong pull from her . I went straight to her and bow down my head and touch her feet. I felt that she is my great grand merciful mother. That was my first impression with her. 13 years. We learn so much from your faith in Baba and all the classes. Make others happy & learn to be not very sensitive . Happy 100th Birthday. What a milestone !!! Thank you for always being there for all, in mind, spirit and body. You are a great inspiration for us all. You are a great donor of knowledge, which is tried and tested. It is a great privilege of knowing you, being in your company, whenever possible. You are an inspiration for millions. We all still alive only because of you. I wish Dadi live till the end of the confluence, till the golden age comes…. Unlimited Thanks for your love, sustenance, care,share and many many many more….Love u Dadi. This is the song my heart is singing. Happy Birthday, Dadi! Your vibrations are so powerful. I feel them all the way here in the Philippines. And to think that we first met in Manila in l986 and you have been inspiring me until now as if it was only a minute ago. Thank you for empowering me. I hope I can pass on to others Baba's power.